A month ago I took a very short trip to India to attend my cousin's wedding. It was a great trip packed with lots of travel and some memorable moments with my family. Most of my cousins were able to make it to the wedding. It was a fun filled time of togetherness. The functions related to the wedding, girls day out together for shopping, meeting my high school friend, boating in the lake with the newlywed and the awesome Keralite food were the best part of the trip. When I finally made the decision to go to India, I made a mental note of a list of things I wanted to have. I had most of them during my short trip. Even though it was extremely hot there, the mangoes, jackfruit, guava, papaya, yucca from our own backyard were the perks of the summer season. My cousin even bought a box of the sweetest Alphonso mango for us from Bombay. I was devouring everything that was placed in a plate in front of me without bothering a bit about gaining some adipose here and there. 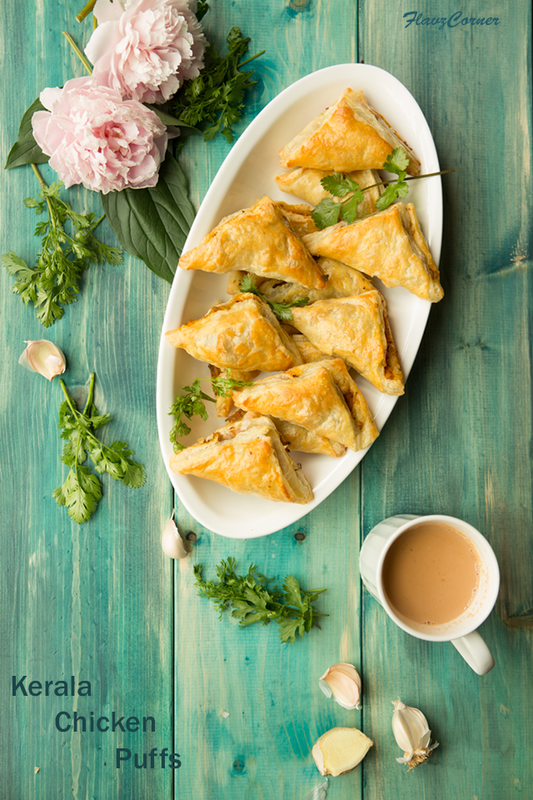 One of the most wanted in my list was the Kerala Chicken Puffs. After a long day shopping, kids and adults were super hungry and we were passing through the town that was well known for this famous bakery. Within few minutes the nostalgia of eating the hot puffs for snack soon kicked both me and my brother and we screamed out together 'Let’s have some puffs'. Soon we pulled over to the side of the bakery and got a dozen of freshly baked puffs. Kids were initially reluctant to try, but once they tried the puffs they couldn't stop with one. Since then I was waiting to come back home to try my hands on homemade chicken puffs. 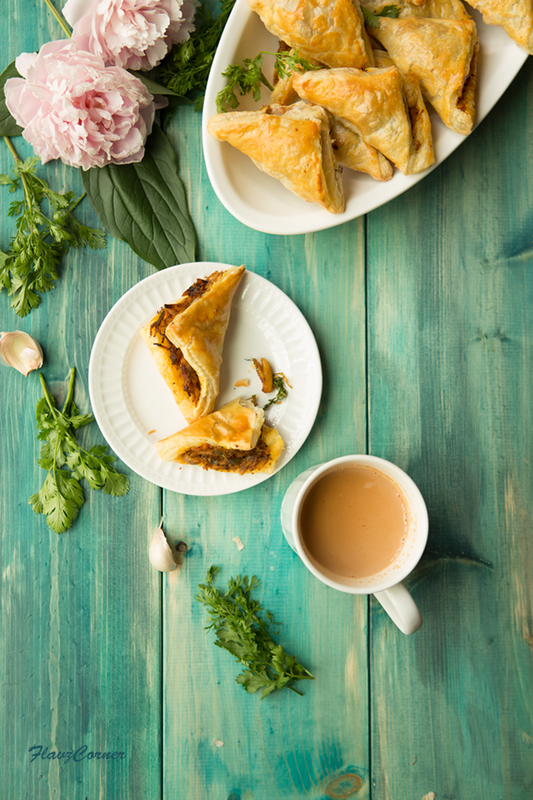 It’s perfect for evening snack with a cup of tea. Hope you will try this out soon. Take the frozen puff pastry sheets out of the freezer and leave at room temperature to thaw as per the directions on the package. Meantime you can prepare the stuffing. In a non-stick/cast iron pan heat 1 tsp of oil and add all the ingredients from List 1 together; mix well; cover and cook till the chicken is well done and all its juice is evaporated. Remove the chicken to a bowl and use 2 forks to shred the chicken pieces. Wipe the same pan with a paper towel and add 2 tsp of oil and splutter the mustard seeds. Cook onions, ginger, garlic and green chili till the onions are light golden brown. Add the turmeric powder, garam masala and the cooked chicken. Mix well and cook till the raw smell is gone. The mix should be wet and not dry. Add the curry leaves and cilantro and turn off the flame. The thawed puff pastry should not be sticky to handle. On a floured surface, open the puff pastry sheets one at a time. Each sheet will be folded 2 times to form 3 sections. Cut the sheet along the folds into 3 long sections. Cut each section into 3 equal sized pieces. It should give you 9 pieces from one sheet. 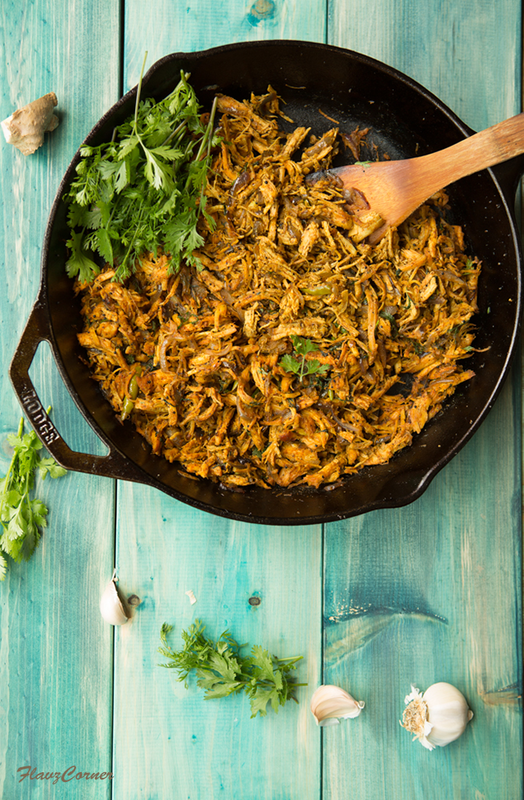 Take 1 - 2 tsp of the chicken filling and fill one side of the each piece and fold it diagonally to form a triangle. Press the edges to seal well. Brush the top of the chicken filled puffs with beaten egg. Bake for 12 - 15 minutes till the top of the puffs turns golden brown. Once the first batch is done, take the second sheet out of the package and prepare the puffs as mentioned in step 6. 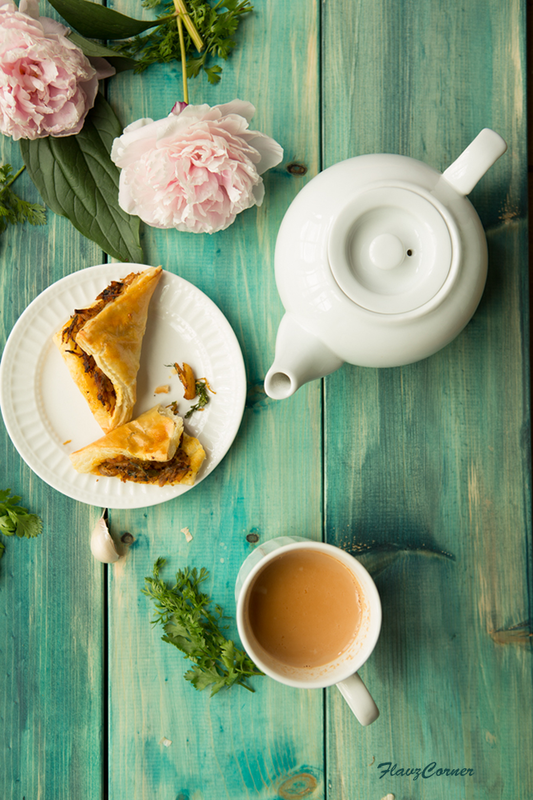 Enjoy the warm Chicken puffs with a cup of tea. Make sure to follow the package directions to thaw the pastry sheets to get better results. If sticky use some flour. The sheets should be thawed enough that its pliable to fold. You can also make the square shaped puffs if you prefer. Just sandwich the filling between 2 square sheets and rest of the steps should be the same. Enjoy the puffs when they are fresh. The puffs can be reheated in a toaster oven or conventional oven at 400°F for 5-6 minutes. So delicious! I can never resist puff pastries! We all go home wanting to hog, right? :) HD is not a foodie and I have to literally beg him to eat from out! Sometimes, I secretly wish I don't have to go with him, can stay at my parents and eat to my heart's content with uppa around... :D Those chicken puffs are calling my name. I have some sheets sitting in my freezer and am wondering what to make of them during this month. Thank you for making my decision easy! Puffs is just addictive right. love it . Its always on my list of "to have" when in kerala :)... adipoli board and the entire photography setup looks so good.